Vitamin D: The Dynamite Vitamin That’s Not Really A Vitamin! In the last few years it seems that suddenly Vitamin D is the “go to” nutrient for almost anything that ails you. I remember when you really didn’t hear much about D, which gave me the impression it must not be that important to our health. Now they’re finding that it is not only necessary for bone health, but also can help protect against colds and flu (including swine and N1H1 flu! ), a number of cancers, and more. 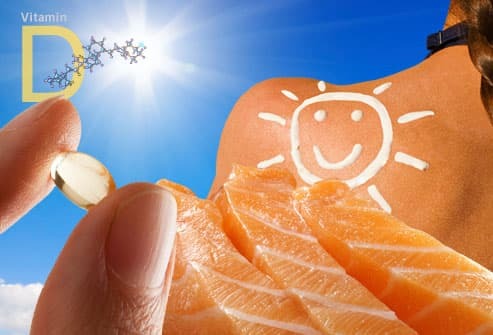 In one blockbuster study after another, vitamin D is being revealed as one of nature’s wonder nutrients. And what’s interesting is that as they are discovering how big of a player vitamin D really is, they are also finding out that most people are deficient in this “sunshine vitamin.” Even 83% of the people living in Saudi Arabia, one of the sunniest climates around, were found to have low levels of D. The Mayo Clinic recently found that 100% of the African-Americans, Hispanics, and Native Americans they tested had low levels. And in another Mayo Clinic study that was based in Minnesota it was found that overall 93% of 150 schoolchildren and adults were deficient in D, so it’s an issue affecting an extremely large portion of the population (btw, I turned out to be defecient when I was tested several years ago). This is a serious health problem because chronic deficiency has now been shown to play a role in 11 types of cancer, as well as in inflammatory conditions such as lupus, rheumatoid arthritis, and Crohn’s Disease. Low levels of D also play a part in heart disease, pain issues, diminishing cognitive function, and weak, brittle bones. The body uses D for normal immune system function, to control cellular growth, and to absorb calcium from the digestive tract. It also helps fight inflammation, which is basically the body’s reaction to stress or dis-ease. Long term inflammations can lead to chronic diseases like lupus, rheumatoid arthritis, inflammatory bowel disease, chronic muscle pain, heart disease, depression, dementia and a wide range of cancers, including skin melanomas. So having adequate levels of D for fighting inflammation is extremely important. D3 (cholecalciferol), one of the forms of the vitamin, can inhibit the growth of malignant melanoma, breast cancer, leukemia, and mammary tumors in laboratory animals. D3 also inhibits angiogenesis, the growth of new blood vessels that permit the spread of cancer cells through the body. In animals fed a high fat diet, which normally would produce a higher incidence of colon cancer, supplements of calcium and vitamin D blocked this carcinogenic effect of the diet. “The results of a study published in the Journal of Bone and Mineral Research may surprise you. It looked at around 10,000 people of all ages and found that getting enough vitamin D was more important than getting high amounts of calcium. In fact, it concluded that women don’t need more than 566 mg of dietary calcium a day (and 626 mg for men). That’s right. Dietary calcium. This study found no reason to take high amounts of calcium in supplements. In fact, the researchers suggested that taking more calcium may be important only for women with vitamin D levels less than 50 nmol/L! And this you can get from your diet. “Because vitamin D is so cheap and so clearly reduces all-cause mortality, I can say this with great certainty: Vitamin D represents the single most cost-effective medical intervention in the United States.”~ Dr. Greg Plotnikoff, Medical Director, Penny George Institute for Health and Healing, Abbott Northwestern Hospital in Minneapolis. “I believe [vitamin D] is the number one public health advance in medicine in the last twenty years.” ~ Dr. John Whitcomb, Aurora Sinai Medical Center. “This is like the Holy Grail of cancer medicine; vitamin D produced a drop in cancer rates greater than that for quitting smoking, or indeed any other countermeasure in existence.” ~ Dennis Mangan, clinical laboratory scientist. “No other method to prevent cancer has been identified that has such a powerful impact.” ~ Dr. Cedric Garland, Vitamin D expert. “Vitamin D is, without question, the miracle nutrient of the century. “~ Mike Adams, natural health researcher and author. “I would challenge anyone to find an area or nutrient or any factor that has such consistent anti-cancer benefits as vitamin D. The data are really quite remarkable.” ~ Dr. Edward Giovannucci, Vitamin D expert. “In all my many years of practice of medicine, I’ve never seen one vitamin, even vitamin C, have such profound effects on human health.” ~ Dr. Soram Khalsa, board-certified internist and medical director for the East-West Medical Research Institute. That’s just a very short list of some of the findings now coming out, but enough to make it clear that everyone should be getting plenty of D. If you don’t spend time in the sun, or always wear sunscreen and are therefore having to rely on your diet for adequate amounts of this vitamin, you may be in for trouble. Food sources of D are rather limited—mainly cod liver oil, milk, eggs, fortified cereals and certain varieties of mushrooms—so you may want to rely on a supplement to make sure you’re getting enough. Vitamin D supplements have always been readily available, and there are even more now that it’s showing itself to be such a powerhouse. And in light of recent findings, many companies are putting out versions of D with much higher doses than before. Up until a few years ago I didn’t take any vitamin D, other than what was in my calcium supplements, but after all the reading and research I’ve done, I decided to change that. I began taking around 4000 I.U. a day, and was a little concerned that that might be too much, even though that amount and more is now being recommended by a number of doctors. But I had my blood level tested and was still way below the 50 to 100 therapeutic level that is becoming the new standard if you want to really experience D’s protective qualities. So now I’m taking around 10,000 I.U., although everyone should be tested to know what dosage is right for them. I like using a liquid supplement because it’s easy to get a high dosage without swallowing a lot of pills. It’s almost taste-less, although this can vary, depending on the brand, and you can even add it to your salad dressing and get your dosage that way. Just be sure when buying any D that you’re getting D3 (cholecalciferol), not D2, an inactive form of D that’s about 10 times less effective because it’s hard for the body to absorb and use. Also, since D is fat-soluble, always take it with some fat/oil containing food. And be sure you’re taking an adequate amount—many researchers, doctors, and healthcare practitioners are now saying that the RDA recommendation of 400 I.U. is way too low, and that we should be getting between 2000–5000 units a day (some set therapeutic dosage as high as 50,000 I.U. a week). The old fear of over-supplementing with D3 is a myth and has largely been debunked by independent research. They’ve found that people have taken very high doses for as long as a year with no ill effects, so make sure you’re taking enough to have a preventative effect. However, as with anything, use good judgment and self-test or have someone muscle test you when deciding how much you should take. This particular article talks about how low levels of Vitamin D2 are directly linked to an increased risk of Alzhemier’s. It’s interesting in that this is the first time I have come across evidence of D2 being so important. I used to worry that the almond milk I drink contains D2 and not D3, but maybe that’s a good thing after all?! And if you would like a free 4-page report by Dr. Nicolas Hedberg about how to fortify your immune system against the flu and other “bugs” by using vitamin D and other natural substances, go to my What’s New or To Your Health page and send in a request or leave a comment on this post. Also, you can get D in a wide variety of doses and formats at discount prices at Vitacost.com, one of my favorite on-line places. If you shop at Vitacost, sign up for a free account at eBates.com beforehand, if you don’t already have one. That way you can use the eBates portal to shop at Vitacost and earn cash back on your purchases. Plus, if you are new to Vitacost and spend a certain amount (I believe it’s $25), you will get a $10 coupon to use; eBates also gives a gift card or some other “prize” when you place your first order of $25 or more. How does it get any better than that?! iHerb.com is another good discount place to shop (use code CJG192 if you are a new customer and spend more than $40 and you will get $10 off and free shipping on $25 or more, plus you can choose something from their free samples and take advantage of their wonderful trial offer section). p.s. Be sure to subscribe to Self-help Health so you don’t miss any future posts, and tell your friends to do the same. Also check out my website’s To Your Health page and Evolution Made Easier blog for more helpful health tips, tools and information. Disclaimer: Please note that any information here is provided as a guideline only, and is not meant to substitute for the advice of your physician, nutritionist, trained healthcare practitioner, and/or inner guidance system. Always consult a professional before undertaking any change to your normal health routine. A Revolutionary Way To Save On Food!